The smallest of the retrievers, these “Little Red Dogs” are energetic, intelligent, fun-loving and often mischievous. They really enjoy the outdoors, playing in the woods and fields and swimming in lakes, streams or mud puddles. They are equally content to curl up beside you on the couch while you are reading a good book about how to get them to stay off the couch. 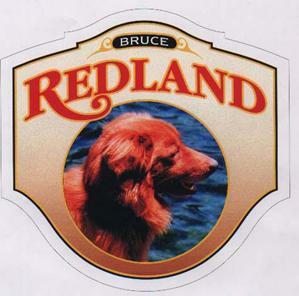 Pictured on the logo is Harbourlights Salty Dog WC, the foundation stud dog for Redland Kennels. For further information about the kennel, the breed or when puppies might be available, feel free to contact by email, phone or snail mail at the addresses given below. Or give us a call and come visit.